Q3. Which of the following bridge IDs would win election as root, assuming that the switches with these bridge IDs were in the same network? Q4. Which of the following facts determines how often a nonroot bridge or switch sends an 802.1d STP Hello BPDU message? Answer: B and D. RSTP uses port states of Forwarding, Learning, and Discarding, with Forwarding and Learning States performing the same basic functions as the STP port states with the same name. Which of the following answers is true regarding the switch on which this command output was gathered? a. The information is about the STP instance for VLAN 1.
b. The information is about the STP instance for VLAN 3.
c. The command output confirms that this switch cannot possibly be the root switch. Answer: B. Cisco switches use the extended system ID format for bridge IDs by default, in which the priority field is broken down into a base priority value (32,768 in this case) plus the VLAN ID. The priority of this switch allows it to be capable of being the root switch, but the command output does not supply enough information to know whether this switch is currently root. SW3 has no STP-related configuration commands. The Hello received on Fa0/13 lists cost 10, and the Hello received on Gi0/1 lists cost 20. Which of the following is true about STP on SW3? a. SW3 will choose Fa0/13 as its root port. b. SW3 will choose Gi0/1 as its root port. c. SW3’s Fa0/13 will become a designated port. d. SW3’s Gi0/1 will become a designated port. Answer:B. The two interfaces default to a port cost of 19 (Fa0/13) and 4 (Gi0/1), making SW3’s cost to reach the root 10 + 19 = 29 out Fa0/13, and 20 + 4 = 24 over Gi0/1. SW3 therefore chooses Gi0/1 as its root port. SW3 could then advertise a cost of 24 (cost to reach the root) Hello out Fa0/13, but it would be inferior to the Hello already being received on Fa0/13 (cost 10), so SW3 would not choose Fa0/13 as a designated port. Q11. What do switches do when a frame with a new source and destination MAC address is received? Answer: When a switch receives an Ethernet frame that contains an unknown source MAC address, it associates that MAC address with the receiving interface in the CAM table. When the switch receives an Ethernet frame with an unknown unicast destination MAC address, the switch floods that frame out every port except the one on which it was received. Q12. What is the purpose of Spanning Tree Protocol? 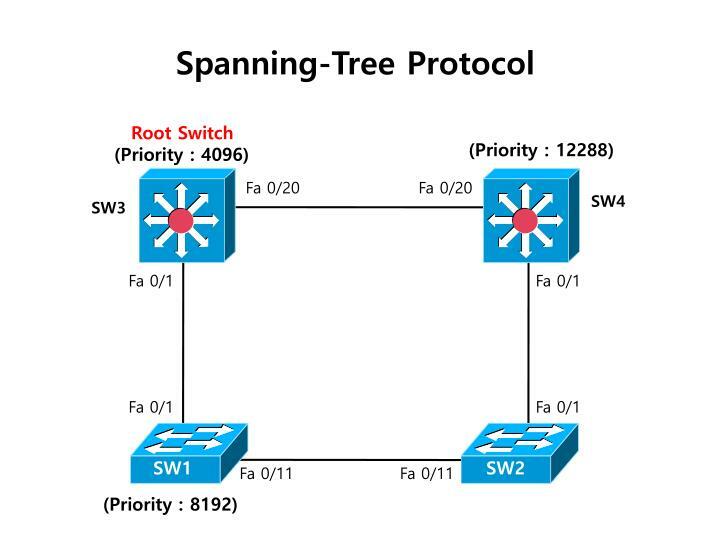 Answer: Spanning Tree Protocol eliminates switching loops in environments when multiple switches are connected in a redundant design. Q13. How is a root bridge elected? Answer: The root bridge is elected based on the switch that has the lowest advertised Bridge ID in the switches’ BPDUs. The Bridge ID is composed of the priority plus the switch’s MAC address. If another switch with a lower Bridge ID is added to the STP topology, a re-election occurs, and that switch becomes the new root bridge. Q14. How do you configure IP connectivity to a Layer 2 switch? Answer: To gain IP connectivity to a Layer 2 switch, you must configure its management VLAN1 interface either manually with ip address ip-address mask command or dynamically using the ip address dhcp command. If you are connecting to the device remotely from another network, the switch must also have a gateway of last resort configured statically using the ip defaultgateway ip-address command or dynamically from a DHCP server. Q15. When is it appropriate to run a switch interface in half duplex versus full duplex? Answer: When you connect to a hub, collision detection must be enabled; thus, you must run the interface as half duplex. Full-duplex interfaces have collision detection disabled and can be enabled only when the switch port is connected to another switch or an end device. Answer: C, D. The Bridge ID comprises the bridge priority plus the MAC address of the switch. Answer A is incorrect because Layer 2 switches do not use IP addresses for Bridge IDs. Answer B is incorrect because the port priority is used as a tiebreaker only when determining the root or designated ports. A. This switch is the root bridge. B. The forward delay times have been changed. C. The max age timer has been changed. D. The priority has been changed. Answer: A. The output displays the Root Bridge ID with a different MAC address than the local switch. So, this switch is not the root bridge. The timers and priority are all still their default values. B is incorrect because the forward delay timers are at their default value of 15 seconds. Answer C is incorrect because the max age timer is at its default value of 20 seconds. D is incorrect because the switch’s priority is at its default value of 32768.
what speed is the interface? Answer: D. A port cost of 19 is 100Mbps. Answers A, B, and C are incorrect because 10Gbps has a port cost of 2, 1Gbps has a port cost of 4, and 10Mbps has a port cost of 100. Q19. Which of the following can be determined from the following output? A. This port has the slowest connection back to the root bridge. B. The port priority has been administratively changed. C. This interface is learning MAC addresses. D. Data is being forwarded. Answer: C. Because the interface is in the learning state, it is beginning to learn the MAC addresses on that interface. Answer A is incorrect because the port is the root port, indicating that it is the fastest back to the root bridge. Answer B is incorrect because the port priority has not changed from its default value of 128. Answer D is false because the port is in the learning state; it still is not able to forward traffic. A. Switch A will have a root port. B. Switch D will have a designated port. C. Switch D will have a blocking port. D. Switch A will have a designated port. Answer: C, D. Switch A has the fastest way back to the root (itself) on that segment, so it will be designated. Because Switch D’s interface is not a root or a designated port, it must be blocking. Answer A is incorrect because only nonroot switches and bridges have root ports. Answer B is incorrect because Answer D has the slowest path back to the root for that particular segment. Q21. Which frame transmission method is latency varying? Answer: A. Only the store-and-forward are latency varying because they have to buffer frames of different sizes. Answers B, C, and D are incorrect because cut-through looks at only the destination MAC address, and fragment-free looks at the first 64 bytes, so their latency will not vary. Q22. Why is the following output false? A. There are no static MAC address entries. B. There cannot be two MAC addresses learned on the same interface. C. No multicast entries are shown. D. A broadcast address should not be present in the CAM table. Answer: D. The source MAC address in an Ethernet frame should not be a broadcast (only destination addresses), so a switch should never have that entry in its CAM table. Answer A is insignificant because static entries are not mandatory. Answer B is incorrect because a switch can learn multiple MAC addresses on a single interface. Answer C is incorrect because multicast addresses should not be present in a CAM table by default. Q23. What is the purpose of configuring a default gateway in a Catalyst switch? A. To have the switch act as the default gateway for end devices connected to it. B. To enforce all STP ports to a forwarding state so all switching traffic goes through the switch. C. To enable Layer 3 routing in the switch. D. To specify the IP address of the router that will forward requests made to the management IP address of the switch from devices on other subnets. Answer: D. The default gateway is the IP address of the Layer 3 routing device that is used when devices are issuing Telnet, SSH, HTTP, and SNMP requests to the switch. To respond to these requests, the switch must send the responses to the router who in turn will route them back to the end device. Answer A is false because the switch itself is not the Layer 3 gateway for other devices despite the fact that the Layer 2 frames are switched through it. The default gateway for end devices is still the router of the LAN. Answer B is incorrect because the default gateway is not related to STP. Answer C is incorrect because the ip default-gateway command does not enable Layer 3 routing in switches. The command to achieve Layer 3 routing is ip routing and is useful only if you have a Layer 3 switch. A. A re-election will occur, and the new switch will become the root bridge. B. The new switch will determine the fastest path back to the root bridge and make that its root port. C. If the added switch creates a redundant path, at least one switch port in all of the interconnected switches will be in a blocking state. D. The switch will immediately begin forwarding frames sent to it by end devices connected to it. Answer: B, C. Because this switch has a higher Bridge ID, it does not become the root bridge. It elects the fastest port back to the root bridge as its root port. If the added switch creates a redundant loop in the switched network, STP blocks one of the ports to avoid broadcast storms. Answer A is incorrect because the BridgeID must be lower than the current root bridge to force an election. Answer D is incorrect because the switch will still transition into the listening and learning states before forwarding frames. Q25. You just connected your interface to a hub. Which of the following must be true? A. Your speed must be 10Mbps. B. Your duplex must be full. C. Your duplex must be half. D. CSMA/CD must be disabled. Answer: C. When connecting to a hub, you have to be able to detect collisions; thus, you must be running half duplex. The speed doesn’t matter, so Answer A is incorrect. Answers B and D are incorrect because setting the port to full duplex disables CSMA/CD. Q26. Why would you use PortFast with BPDU Guard? Answer: PortFast is a Cisco-proprietary enhancement to STP that enables a switch port to bypass the listening and learning STP states for end devices such as workstations and servers. BPDU Guard protects PortFast interfaces from switching loops by disabling an interface if a BPDU is received from another switch. Q27. What is the advantage of using UplinkFast? Answer: UplinkFast is useful when you have redundant uplinks to its distribution switch. If the root port to the distribution switch fails, UplinkFast skips the listening and learning states and immediately begins forwarding on the redundant link. Q28. What is the advantage of using BackboneFast? Answer: BackboneFast speeds up convergence by skipping the max age time when switches learn of a failure indirectly through an inferior BPDU from a neighboring switch. Q29. In what circumstances would you have a backup or alternate port state in RSTP? Answer: Alternate ports are redundant root ports placed in a discarding state in which they immediately transition to a forwarding state if the primary root port fails. Backup ports are also discarding ports that provide a redundant connection to the designated port for a specific LAN segment. If the designated port for a given segment were to fail, the backup port would immediately transition to a forwarding state. Q30. What is the primary purpose of synchronization? Answer: The purpose of RSTP synchronization is to ensure that a switch synchronizes new root information accurately to all other ports without causing a loop. It achieves this by putting all nonedge ports in a discarding state before agreeing to forward on the new root link. Q31. You’ve connected your switches together with a crossover cable. What would be a possible reason for a switching loop to occur? A. Because STP is disabled by default, you need to enable it on both switches. B. You configured one of the interfaces as PortFast. C. You need to use a straight-through cable. D. The forward delay timers were set to 15 seconds. Answer: B. When PortFast is enabled, you must not connect a switch, bridge, or hub to that interface, or loops may occur. Answer A is false because STP is enabled by default. Answer C is incorrect because you must use cross-over cables when connecting two switches together. Answer D is incorrect because the forward delay timers are set to 15 seconds by default. Q32. Which of the following is actively participating (forwarding frames) in the RSTP topology? Answer: C. Edge ports connected to end devices immediately transition to forwarding states and actively forward frames. Answer A is incorrect because the learning state is learning MAC addresses but is still not in a forwarding state. B and D are incorrect because alternate and backup ports are both in discarding states. Q33. Which of the following is not a similarity between STP and RSTP? D. BPDUs originate only from the root switch. Answer: D. In RSTP, BPDUs originate from each switch and act as a keepalive. STP BPDUs originate from the root bridge and are forwarded by other switches. Root bridge elections, learning states, and BPDUs as communication all exist in both STP and RSTP, so answers A, B, and C are incorrect. Q34. After connecting your switch to another switch, you notice that your interface immediately gets shut down. Which of the following is a possible reason for this occurrence? Answer: A. If an interface is configured for PortFast with BPDU Guard, it immediately puts the switch in a disabled state if it detects a BPDU from another switch. Answer B is incorrect because there would not be duplicate MAC addresses in a switched network. Answers C and D are incorrect because UplinkFast and BackboneFast would not disable a port if connected to another switch. what is the significance of port Fa 0/10? A. It is connected to another switch. B. An end device is connected to this interface. C. It is in a discarding state. D. MAC addresses are not learned on this interface. Answer: B. Because the output indicates that the interface is an edge interface, this means an end device is connected to it. A is incorrect because another switch cannot be connected to an edge port. Answer C is incorrect because the port is a designated port and is forwarding frames. Answer D is incorrect because this interface is forwarding; thus, it is forwarding frames and learning MAC addresses. A. Fa 0/3 has the fastest path to the root switch. B. Fa 0/2 has a viable path back to the root switch. C. If Fa 0/3 goes down, Fa 0/2 transitions to a listening and learning state before forwarding. D. This switch can interoperate with 802.1d STP. Answer: C. Alternate ports immediately transition to a forwarding state if the root port goes down. A is true because Fa 0/3 is the root port. Answer B is true because the alternate port must have a viable path to the root to become the alternate port. D is also true because RSTP is backward-compatible with 802.1d STP. Q37. Which of the following occurs when a link fails in an EtherChannel bundle? A. STP becomes active on the remaining links. B. The bundle redistributes the traffic over the remaining active links. C. The entire bundle is shut down, and an administrator needs to reenable it. D. Another interface is automatically added to the bundle to compensate. Answer: B. When a link fails in an EtherChannel bundle, the traffic is redistributed over the remaining links. Answer A is incorrect because STP treats the entire bundle as a single link and would not be activated if the bundle remained. Answer C is incorrect because the bundle remains active. Answer D would be nice if it were true, but it is also incorrect because the EtherChannel links are applied only to those interfaces that you have configured to be part of the bundle. A. If Fa 0/1 goes down, Fa 0/2 is the new root port. B. Fa 0/1 and Fa 0/2 are connected to separate segments. C. If Fa 0/2 goes down, Fa 0/1 transitions to a listening and learning state before forwarding. D. If Fa 0/1 goes down, Fa 0/2 is the new designated port. Answer: D. The backup port automatically starts to forward and becomes the new designated port if the current designated port fails. Answer A is incorrect because it will not become a root port. Answer B is incorrect because a backup port exists only if two ports are connected to the same segment. Answer C is incorrect because the link immediately transitions to a forwarding state. Q39. Which of the following is not necessary for UplinkFast to occur? A. The switch must hear an inferior BPDU from a neighbor. B. Failure must occur on the root port. C. The switch must have direct knowledge of the link failure. D. The switch must have one blocked port. Answer: A. Inferior BPDUs are not necessary for UplinkFast to work; they are specific to BackboneFast. Answers B, C, and D are true because a switch must have one blocked port, a failure on the root port, and direct knowledge of that failure for UplinkFast to work correctly. Q40. Which of the following is not part of the proposal/agreement handshake for RSTP rapid transition? A. The switch with the designated port sends the proposal to forward. B. The switch with the root port must sync before agreeing to the proposal. C. As soon as the handshake is complete, each port immediately forwards frames and learns MAC addresses. D. As soon as the proposal is received, it is forwarded to the root bridge. Answer: D. It is not necessary for RSTP switches to forward any notifications back to the root switch like STP. Answer A, B, and C are true because the handshake entails the designated switch sending a proposal. The other switch receives the proposal, blocks all ports connected to point-to-point links, and sends an agreement. When the switches are finished with the handshake, they immediately begin forwarding frames.